Just back from my seventh Picosure session. I had asked for the woman who did the last session and was told it would be with her. However when I got there, I was treated by the man who had done all the others. Nothing against him, he's a really nice guy. I just felt my last session was the single biggest impact session on the whole removal journey, I genuinely felt one more with her may have cleared it. When I went in, he thought it was fading really well. He thinks at this stage that maybe this session will be my last and wondered if I even needed it, he said maybe one more at the end of the summer and then it will just be a matter of patience. As I feel he goes lighter than he needs to, definitely for me, I suggest he go in as heavy as possible for maximum impact. He said he was going to do a double pass. I was ok with this as the last double pass was the second highest impact session. 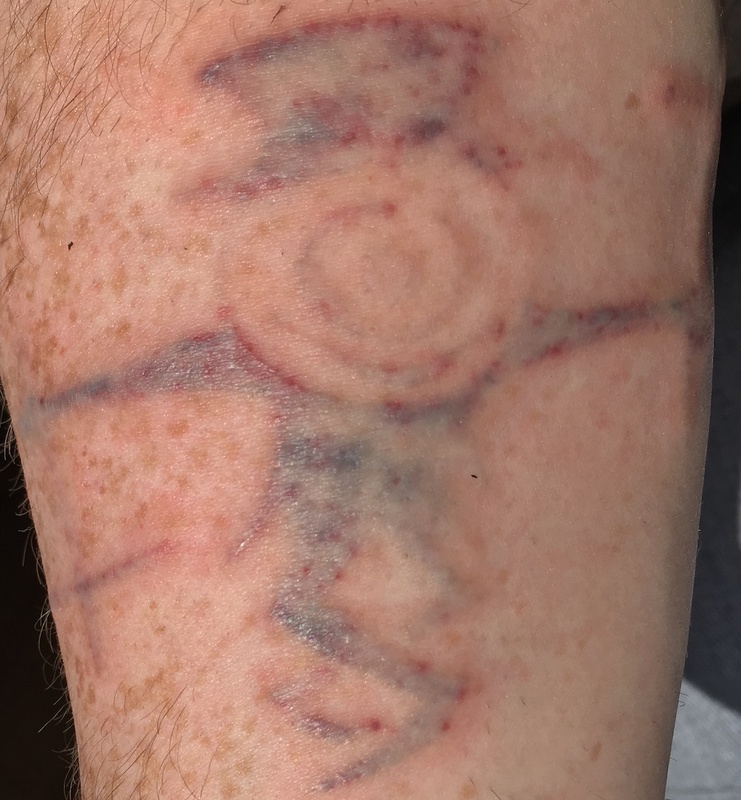 I should always question though, while she caused me a lot of pain last time, the fading is cumulative, maybe that was unnecessary, I will never know. Anyway, it's currently pretty sore. I did my wine bottle cooler thing with this one. I had expected another really harsh session so left a tea towel in the freezer overnight. It's just over 90 minutes since the session completed, the below photo was taken after about 60 minutes of cooling. I'm going to wait until this heals before publishing (Apr 21, 15:44 UTC+1). It's now 14 May 2018, apologies to all who follow my blog (all 0 of you) for not updating sooner. I was away for work and too busy. Things are looking good on the tattoo front, it is definitely showing signs of fading. I really think one more, if that, is all I'll need. Going to ride this one out until September and see how I feel. If it's still pretty visible then, I'll go for what I expect to be my last session. The above was take one week later. It's still a little swollen and my skin is a bit red. It's not easy to see in the photo but I'm going by memory. If you look at some of the (much) lighter ink you can see it's more raised than it should be. I think the total healing time was close to two weeks. I was in California for work, while it wasn't hot, it was sunny, sunny enough for my Irish skin to burn. I was applying lots of sun cream, despite being cold. I took the above today, it's getting really faint now. In some light, you can't even see some it it, though it looks visible in the photo. Like I said above, I'll wait until September before deciding if I need another session. 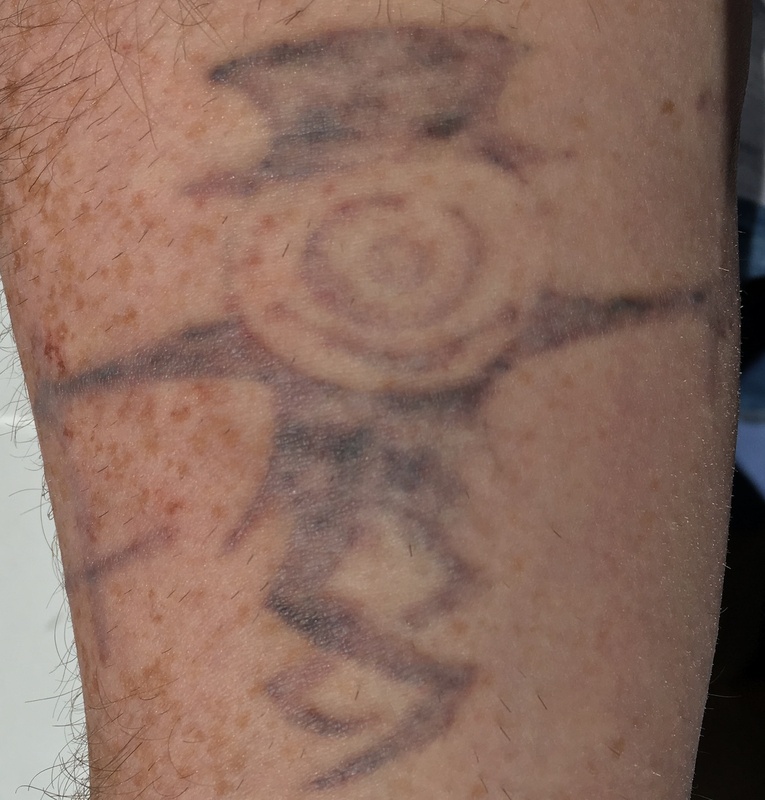 At that stage, I'll be approaching 3 years of laser removal, far more than I anticipated I'd need. He only charged me €50 for the session on 21 Apr, it was normally €75. That's a total of €500 I've spent on Picosure, I think there was a €30 consultation fee and I spent €240 on q-switched. So far that's a total of €770 on removal. Still cheaper than the first place I went to. 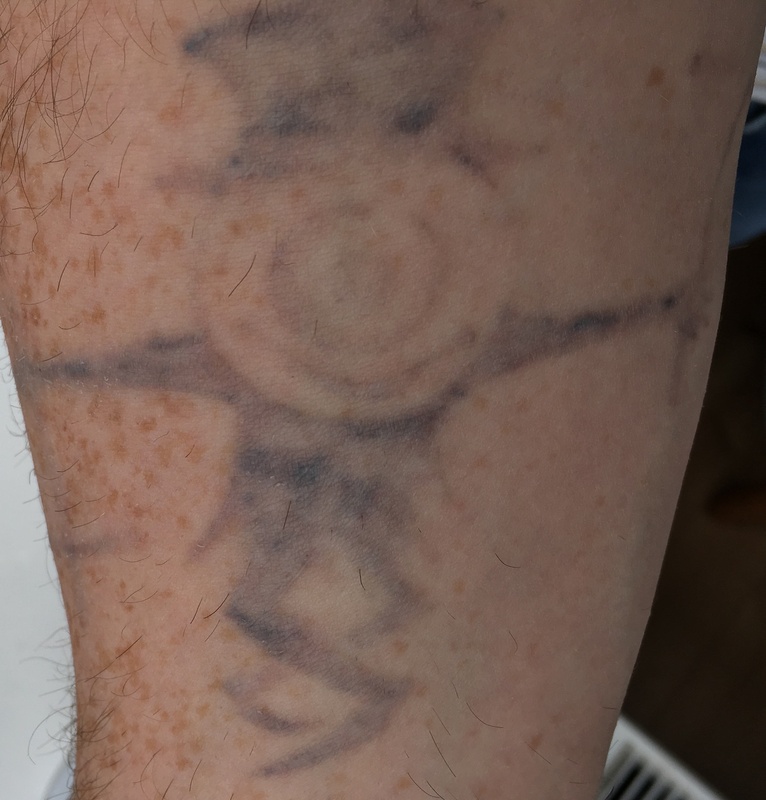 So that's an €80 tattoo that has cost me nearly 10 times that to remove. There's the professional awkwardness and the hassle of removal. If you want a tattoo, get one, but think about it for at least 24 hours. If you regret it, it will take a long time and a lot of money to remove.